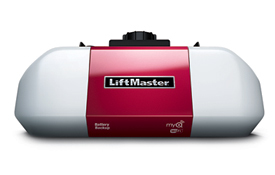 There are many Garage Door Openers brands available in the market, yet the best of all is LiftMaster Openers. Here at Garage Door Technicians, Inc, We offer both chain drive and belt drive LiftMaster Garage Door Openers to our customers. Previously, our customers, especially our Naperville IL & Schaumburg IL customers, always requested for external devices to connect with their home wifi and openers. That way they were able to operate their garage door openers with their smart phones. Now, they no longer need to follow the old-school procedures as our New Lift Master Openers comes with Security+ 2.0®, MyQ® Technology, Battery Backup and the Timer-to-Close feature. These built in wifi features in our openers makes customer’s control easy and simple. Security+ 2.0® : This feature sends automatic notifications along with date and time to your smartphones whenever you garage door opens or closes. You can also choose to receive an email instead. MyQ Technology: Our customers have two options with their LiftMaster Openers in order to operate it with their smartphones. If you already have a LiftMaster opener, the cheapest rout is to buy external MyQ device. Our technician will connect the device both to your opener and your home wifi and will help you set up an online account. If your opener is 10+ years old, or have an out-dated opener and would like to replace it with a new open, then we offer LiftMaster – model-8550w – openers. This comes with built in MyQ and functions as smoothly and efficient as external MyQ device. Battery Backup: This feature is used when you lose power. Timer-to-Close: When installing your opener, don’t forget to ask our technicians to set up this feature for you. With this feature you can set a time, i.e 3 minutes, for your garage door to close automatically. It is important to always have a closed door, specially at nights. Once again, quick reminder to all our customers in Naperville IL, Aurora IL, Schaumburg IL, Plainfield IL, Oswego IL, Btavaia IL, Joliet IL, Lombard IL, if you happen to order one of LiftMaster Openers, please do ask our technicians for setting up your desired security features and connecting them to your smartphone. If you are into technology, we sure hope you like new advancements in our openers as well. Please visit our website and learn more on our garage door openers, garage door springs, Garage door repairs, and contact us directly at 630-520-1466. I am proud to be part of Garage Door Technicians. It is a pleasure serving our communities and near by cities such as North Aurora IL, Aurora IL, Naperville IL, Oswego IL, Plainfield IL, Lisle IL, Bolingbrook IL and Joliet IL.